Black bins are only meant for rubbish that cannot be recycled and for food waste. We can only collect rubbish that is inside your black bin. Bins will not be emptied if they are heavy/overloaded and the lid must be shut. For health and safety reasons, we cannot collect side waste. If you think you qualify, please call 0345 002 0022 so we can arrange for the appropriate form to be sent out to you for completion, so we can determine your eligibility or fill in the online additional black bin request form here. To report a missed or damaged bin, you can fill in one of the online forms below or telephone 0345 002 0022 by the end of the next working day after it was due to be emptied. If the crew have not reported an issue with your bin, we will return within three working days to empty it. Please note there is now a £20 charge to replace lost or stolen black refuse bins only. 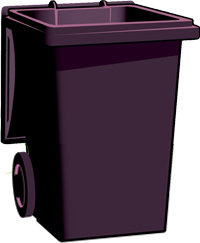 All waste from your black bin is sent to a plant (Energy from Waste plan, Four Ashes) where it is converted into energy. It does not go to a landfill site where it can take years to decompose. By disposing of waste in this way, the contents of black bins across Staffordshire could generate 23 megawatts of energy - enough to power 30,000 homes for a year.